Tori Galloway developed her love for water and passion for conservation on the lakes of Northern Indiana, where she grew up. When she took a diving course at the Center for Underwater Science as a student at Indiana University Bloomington, she found a way to turn those interests into a career. "I was double majoring in anthropology and biology," Galloway said. "But then I heard about the center and took an intro diving course. That changed everything. 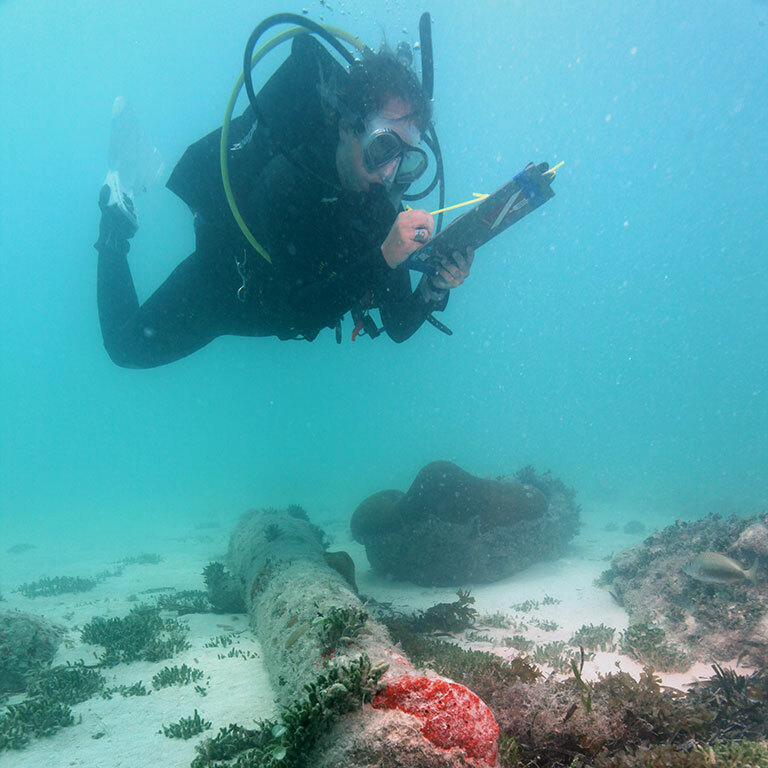 Before the center, I didn't know underwater archaeology was even an option." So in January 2017, the now senior decided to change course, keeping anthropology as her major but switching biology for an individualized major in underwater archaeology. She is also receiving a certificate in underwater resource management. 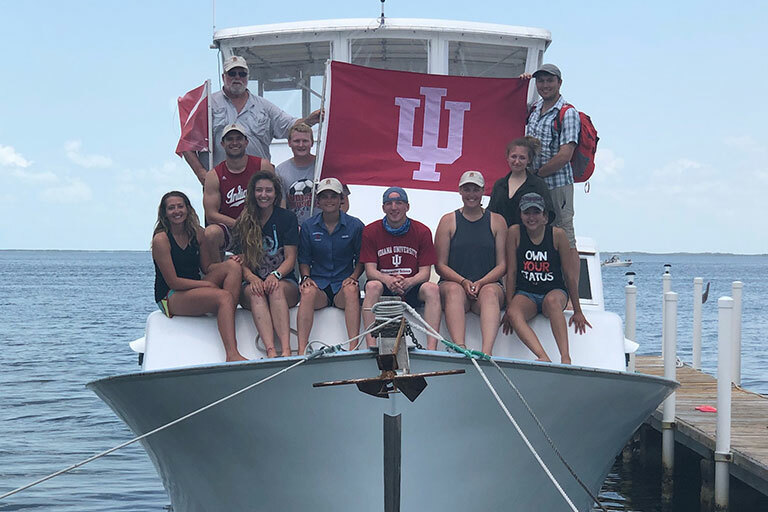 IU's Center for Underwater Science is a multidisciplinary research center in the IU School of Public Health-Bloomington that is dedicated to understanding and protecting submerged cultural and biological resources. It is the oldest and largest academic diving program in the country. For the past two years, Galloway has taken advantage of all the center has to offer. 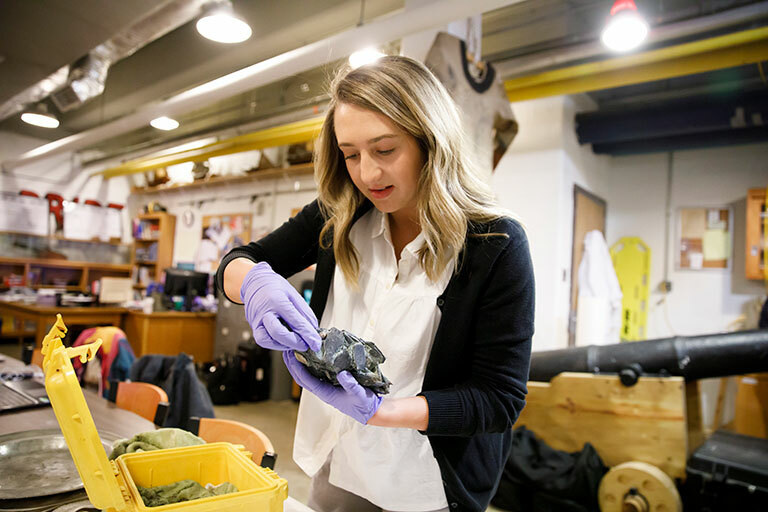 She currently leads some of the center's archaeology research, which includes analyzing archived data and artifacts from shipwrecks and underwater sites throughout the world. One of those sites is the 1733 San Pedro and San Felipe, which are the basis for two of Florida's oldest artificial reefs, off the Florida Keys. Galloway served an internship for the National Oceanic and Atmospheric Association at those sites, a rare feat for an undergraduate student in her field. "I've been working on archives from the 1980s, which is rare that we recorded the biological resources associated with the shipwrecks because no archaeologists were recording the associated biology at that time," Galloway said. "I've been able to go through archival data and work with new technology to put together a more comprehensive site history of the area. The sites are significant to the Florida Keys and we want to protect them, so this research helps in doing that." Galloway also assists with all of the center's diving courses and spends significant time in the field, using 3D photogrammetry to gather data and collecting water samples and images of the site. When they are not in the field, Galloway and her fellow students spend the academic year analyzing that data in the center's lab. Galloway has done work in the Florida Keys, the Dominican Republic, Lake Michigan and Lake Monroe. One of the locations that made the biggest impression on Galloway is the Florida Keys, where she has traveled twice. She also left an impression on the NOAA staff she worked for there, according to Sam Haskell, IU diving safety officer and underwater science assistant director. "After Tori returned from her internship, I was speaking to the unit diving supervisor from NOAA, and he mentioned that following a dive, an expensive dive computer was dropped while the crew was passing gear from the dock to the boat," Haskell said. "Tori immediately put her bags down and dove right in, retrieving the equipment. Her willingness to jump in the murky canal for someone else's lost piece of equipment was beyond impressive to the NOAA team and perfectly exemplifies Tori's work ethic and determination. The fact that she was then able to actually find and recover the lost computer is even more impressive and exemplifies her exceptional ability and impressive skillset." As she heads into graduation, Galloway will continue her work at the center while pursuing a master's degree in anthropology. She is thankful for the numerous opportunities the center has provided her throughout the years but for the faculty and administration who have helped her along the way. "I was drawn in because of the research. The center has offered me so many opportunities," Galloway said. "I think I stayed because of the people. The people I work with are family at this point." On Tuesday, March 26, join us as we follow Galloway through her day as an IU student as part of our One Day/One Hoosier series. Look for her story through @IUBloomington on Twitter, @iubloomington on Instagram and iu_bloomington on Snapchat as it happens live starting around 8 a.m. EDT.